Evidence to inform policy-makers can be sought in different ways, depending on several factors, including: the timeframe in which the researcher has to operate (how quickly a policy-maker requires a response), the resources available and the type of evidence required (for example, global or local). The nature of the query or policy-maker’s request dictates the type of evidence and how it is made available. If no evidence is found, the alternative measures available may require consideration. A new Health Evidence Network (HEN) synthesis report has been published summarizing the best available evidence on strategies to address communication barriers for refugees and migrants in health-care settings across the WHO European Region. Recognizing that public health, health care and health systems policy-makers need access to timely, independent and reliable health information for decision-making, WHO/Europe started HEN in 2003. It acts as a platform, providing evidence in multiple formats to help decision-making. Linking research to action with the best available evidence The Evidence-informed Policy Network (EVIPNet) is a WHO initiative that promotes the systematic use of health research evidence in policy-making. 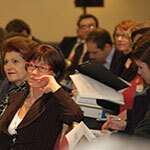 EVIPNet Europe has been operating in the WHO European Region since October 2012. The Research Agenda for Health Economic Evaluation is a research project implemented by WHO to outline gaps in the economic evidence for the treatment of the 10 highest morbidity conditions in EU. The project makes recommendations for future research in the area of health economics. Improving people’s health by enhancing the information that underpins policy The European Health Information Initiative (EHII) is a multimember WHO network that is committed to improving the health of the people of the European Region by enhancing the information on which policy is based. The vision of EHII is an integrated, harmonized health information system for the entire European Region with evidence for policy-makers. This can be achieved by fostering international cooperation to exchange expertise, build capacity and harmonize data collection.